Happy Halloween to all my Halloween loving lovelies! I’ve always been obsessed with Halloween; I feel like I can really let my creativity flag fly. 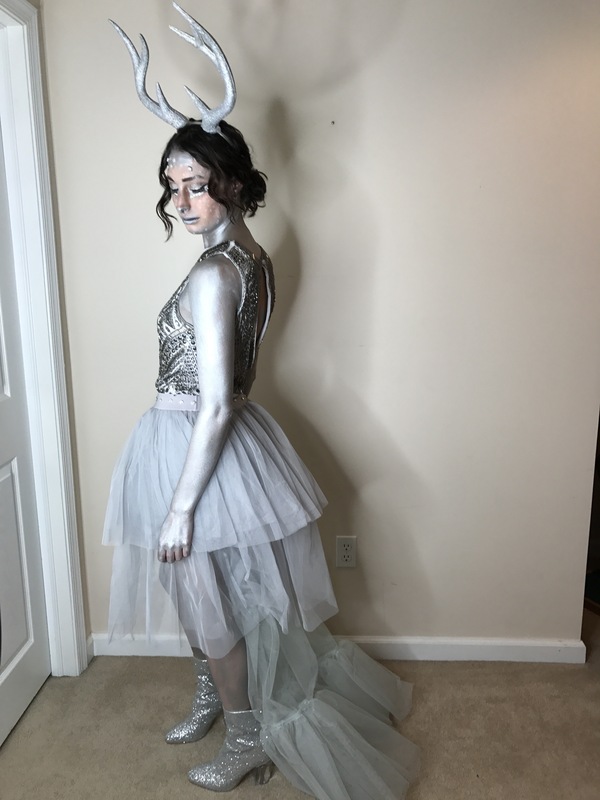 This year I found these amazing silver deer antlers (covered in glittery goodness) at Spirit Halloween, and the idea of being a Harry Potter Patronus morphed. I’m also thoroughly in love with all things Harry Potter. I know it’s a little late to create this look now, but there’s always next year! Or any surprise future costume parties. Below is what I used to achieve this look, now Expecto Patronum! Bodysuit: Asos Night Premium Embellished Body Suit (out of stock currently, but a similar option is Jaded London Sleeveless Bodysuit). 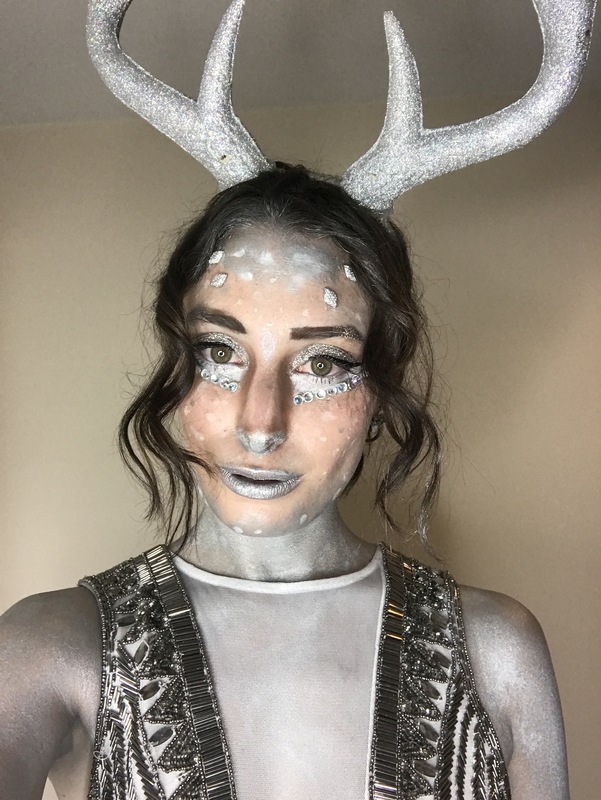 Antlers: Silver Glitter Deer Antlers (on sale!) I did take the elastic out of this and hot glue these to a clear headband. Skirt: Combined Boohoo Sofie Double Layer Tulle Skirt in Grey, and my Nan sewed on the tulle from under a prom dress I found at Goodwill for the train! I embellished the band with the gems from AC Moore and a hot glue gun. Use your regular foundation and concealer. Used NYX Jumbo Pencil in Milk for the spots, along with NYX White Liquid Liner for some smaller spots. Contoured my nose with Kat Von D Shade and Light Palette, any contour shade will do just wanted to make it wider looking. Forehead and chin: Mehron Metallic Powder in Silver, mixed with Mehron Mixing Liquid. Make sure to have enough powder in the liquid for more opaqueness. Used a Q-tip to apply on my nose, and a wedge sponge to apply on the forehead and chin. Also, dotted some spots of this on my face. Lips: Mehron Silver Powder, topped with NYX Wicked Lippie in Stone Cold. Lid: LORAC 2 shadow in Silver (any silver shadow will do). Then, I applied Too Faced Glitter Glue on the lid with my finger and packed NYX Face and Body Glitter in Crystal all over. Underneath: Sculpted this area with NYX Milk Jumbo Pencil, drawing a line from the outer corner of my eye in a diagonal almost to my nose. Then I filled that whole area, and my waterline with Milk as well. Gems: Got both sets at AC Moore. They have sticky adhesive on the back, but I used a little lash glue to hold them on a bit better. Brows: Fill in with your regular brow product, and I added some of the NYX Crystal glitter with the glitter glue on the outer arch. All Mehron Metallic Powder. I used on any exposed skin, so my legs, arms, neck and torso as well as up my neck and some of my back. I needed 2 bottles, and would definitely recommend ordering 3-4 bottles if it’s the smaller powder. I just had enough. First, I mix the powder and mixing liquid. You want the powder to grab your sponge and not be overly liquid-y. Dip a wedge sponge and apply in stroking motions, this works better than patting, that makes it look super spotty. But if you have streaks then pat lightly over the area. This stuff does move a bit before it dries. This will not get on anyone once it dries down, you really have to scrub it off (I went through a whole bar of soap! ), but it’s great for going out as it won’t transfer on people or your car. Hope you guys enjoyed this blog post, and have a safe and very wicked Halloween!